Skip to the end if you just want the recipe card! I promised quite some time ago that I would share my bread recipe when I got it perfected and folks, I have finally done it. Probably somewhere around 50 loaves later, I finally feel like I know what I'm doing, I mean, I can make this by memory now. 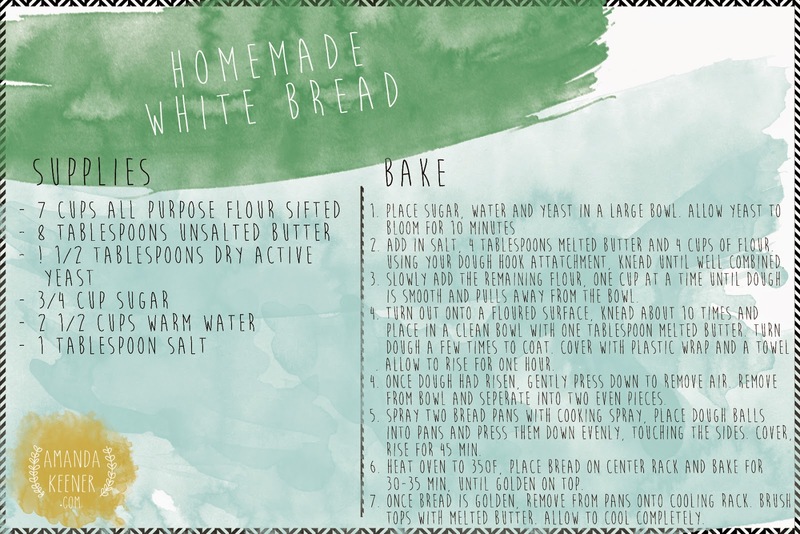 I didn't want to be a half-assed blogger throwing out a bread recipe without really understanding the process. The first bread recipe I tried was good, but the understanding wasn't very good. I've learned my lessons since and I have a couple of tips for you before we begin. 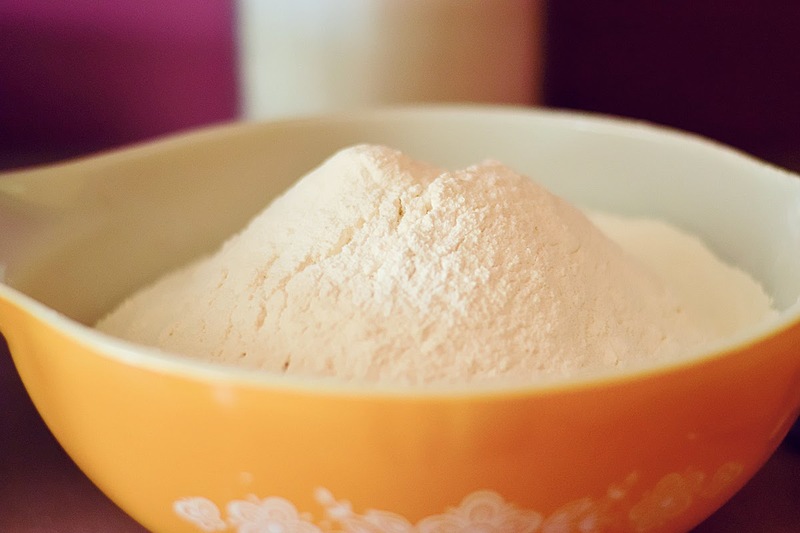 First off, Sift Your Flour before you measure it and put in the bowl. I go ahead and sift the amount I need, for this recipe it is 7 cups, into a separate bowl and then measure it from there. Why sift? Flour is packed into bag, I transfer mine to a pretty glass jar, but it's still packed. Sifting helps aerate the flour, so it's not so heavy. The first time I sifted my 7 cups, I ended up with 2 cups left over because I didn't need all the packed flour once it was aerated. If you get too much flour in your bread it will make it heavy. Wait, sorry, wrong kind. Sometimes as a geek, I get confused. There we go. 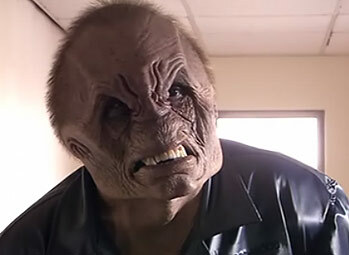 Ewww, much uglier. Simply because all flour goes through a factory [unless you grind your own], these guys tend to end up in there on occasion. It's a good enough reason to sift, right? They're not poisonous but I really don't like eating bugs. 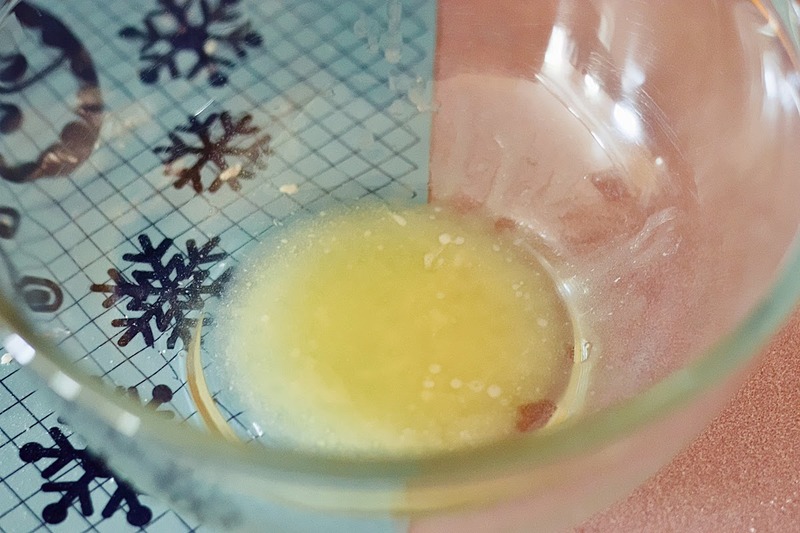 You can read even more about sifting over at Baking Bites. My other tip is to let the bread rise. I know it takes a lot of time to make bread, you just have to deal with it. If you try to shorten the time or skip the process, you'll just end up with a sad, hard lump. Also, don't over do the rise! Or the bread will collapse, bummer. Good news for you, I've made more loaves than I can count and really figured out how long I prefer to let it rise for perfect bread. But depending on your elevation, it could vary. It may take a few tries to get it really figured out. And this one is silly but, only use unsalted stick butter! Why unsalted? Because you don't know how much salt is in salted stick butter and you can end up with something much saltier than you intended. Also be aware that country crock and the likes are not butter! They're spreads and made with oil, things will not turn out pretty. I know this sounds silly, but many years ago, before I was experienced with cooking and baking, I didn't really realize there was a difference. You can laugh, it's okay, we ate a lot of ramen our first year of marriage because I was a horrible cook. The butter tip goes for all kinds of baking and creating. Someone told me they tried to use country crock to make buttercream icing once, I won't name them but I'll admit I laughed. Not cruelly, I laughed and told them all about how I made the same mistakes early on. I don't have stick butter, country crock is the same thing, right? Wrong. They make sticks, but I don't know if that's butter or not. Make sure you're buying real butter. On a side note, and in Country Crock's defense, I love me some spread on fresh bread. That said, let's make some bread! First things first, you need to bloom your yeast. This can be a little tricky because your water needs to be about 110-120 degrees. It's easier to measure if you have a candy thermometer, but I recently broke mine. I have learned how to watch my water along the way, when it just barely starts to form bubbles at the bottom, it's warm enough. You don't rising bubbles and boiling water is WAY too hot. For sanity's sake, get a candy thermometer, it's like $5. 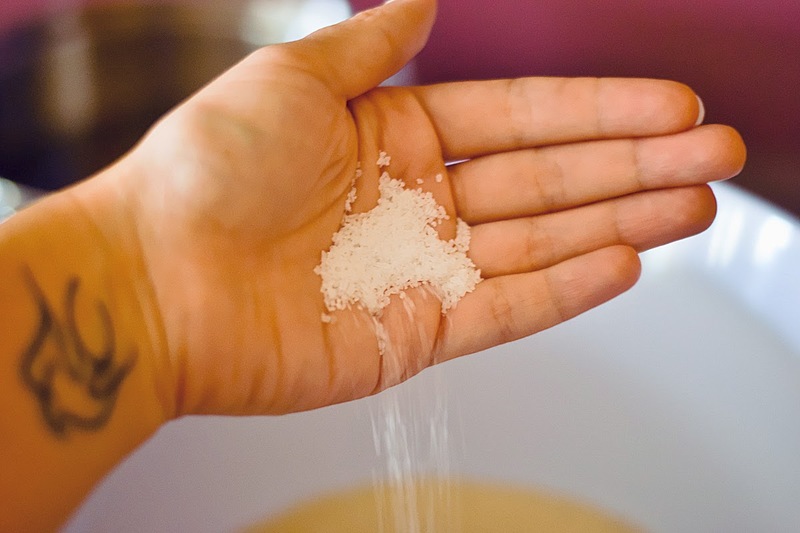 In a large bowl you will combine 3/4 cup of sugar with 2 1/2 cups of water, then sprinkle 1 1/2 tablespoons of dry active yeast over the top. 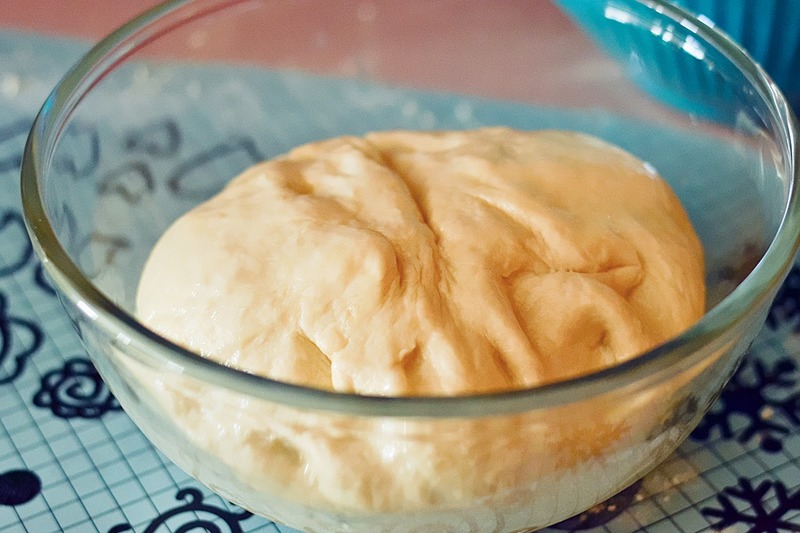 Give it a gentle swirl and let the yeast bloom for 10 minutes. The yeast will smell sweet and look nice and frothy like above. If it doesn't look like froth, you've killed the yeast and you have to start over. It stinks but the whole recipe depends on good yeast. I always buy mine in a jar instead of packets just in case my yeast goes kaput, it happens sometimes. While the yeast is blooming, I usually take the time to sift my 7 cups of flours and melt my four tablespoons of unsalted butter. 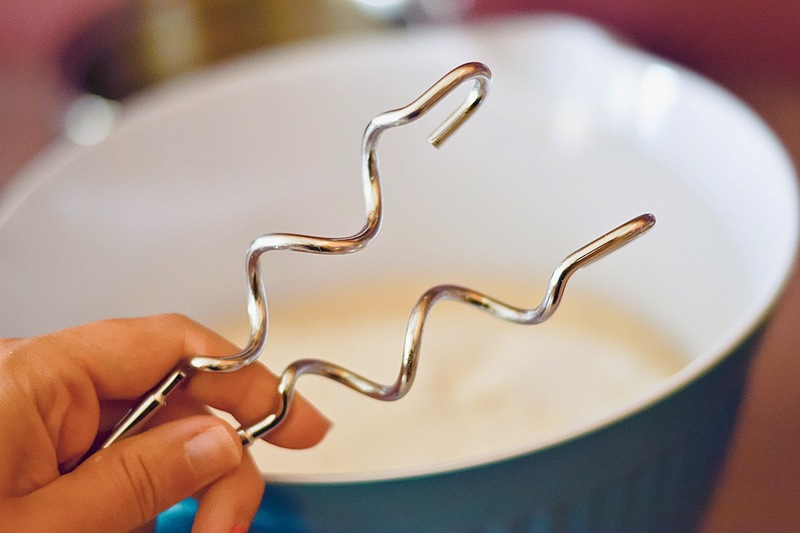 Outfit your hand mixer with dough hooks [Or you're stand mixer if you are so lucky... I'm glaring at you now, you privileged stand mixer owner person. ], these normally come with, if not, there's always your hands. Mix until it looks nice and smooth, like so. It will still be sticky and there are some lumpy looking bits, but that's okay. 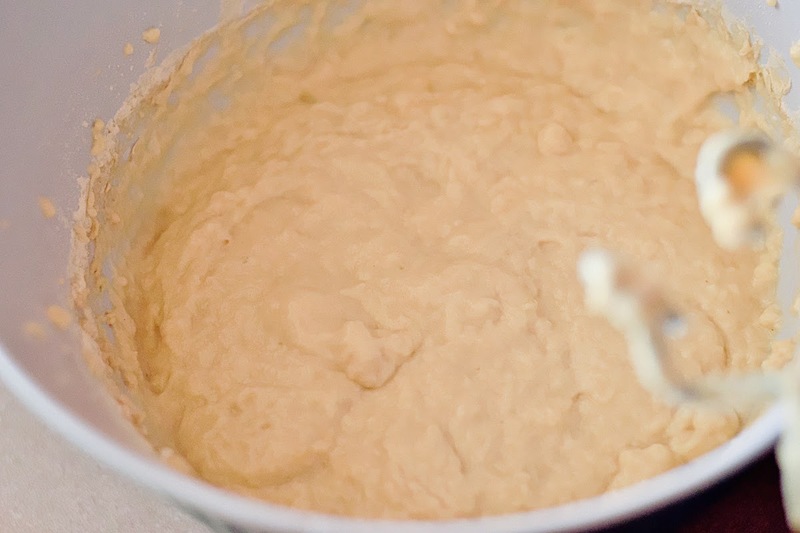 Add one more cup of flour and mix again, this time just until combined [meaning you can't see any dry flour]. At this point you have 5 cups in, go ahead and add one more, making it 6. Again, mix until combined. 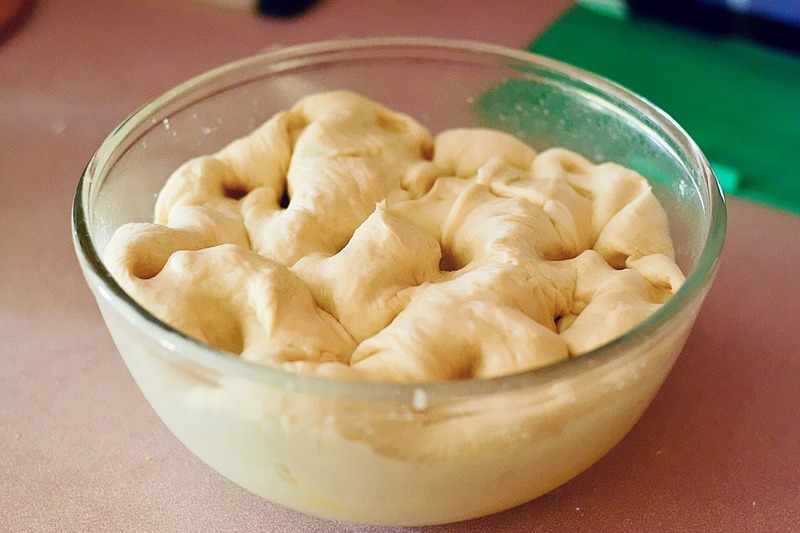 The idea is the get your dough to look about like this. Its smooth to the touch, not sticky and pulls away from the bowl. If yours isn't like that, add the 7th cup of flour. You should need the 7th cup, but if you've skipped sifting or packed the flour in the measuring cup, you may already have too much flour. 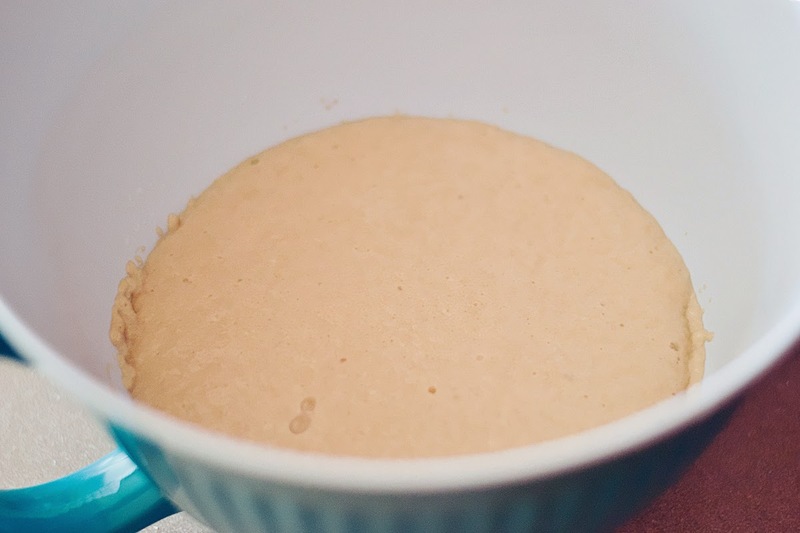 After the 7th cup is blended, if there is still some stickiness, go ahead and add a tablespoon of flour, one at a time until it becomes smooth. Another good test is to gently poke it with your finger. If it bounces back slightly, without sticking to your finger, that's a good sign. 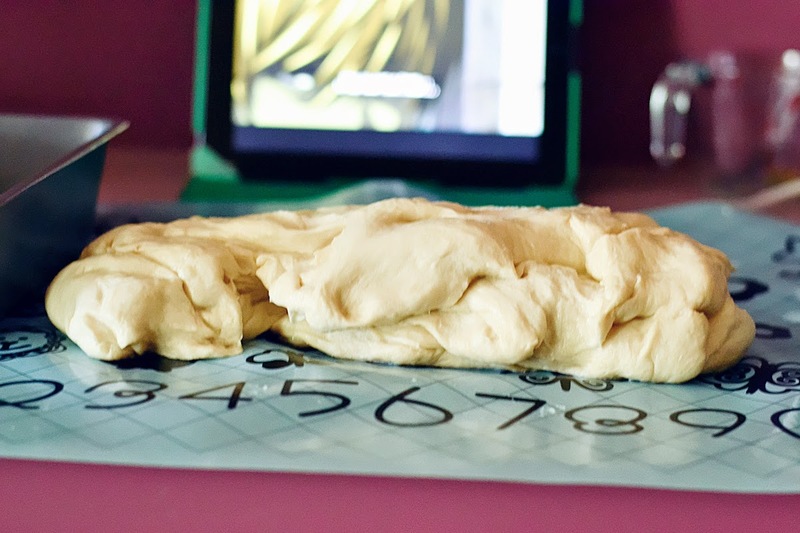 Turn your dough out onto a floured surface, baking mat or even some good ol' wax paper works. You can see that I still have a little flour left, that's okay, it was in the bottom of my bowl. 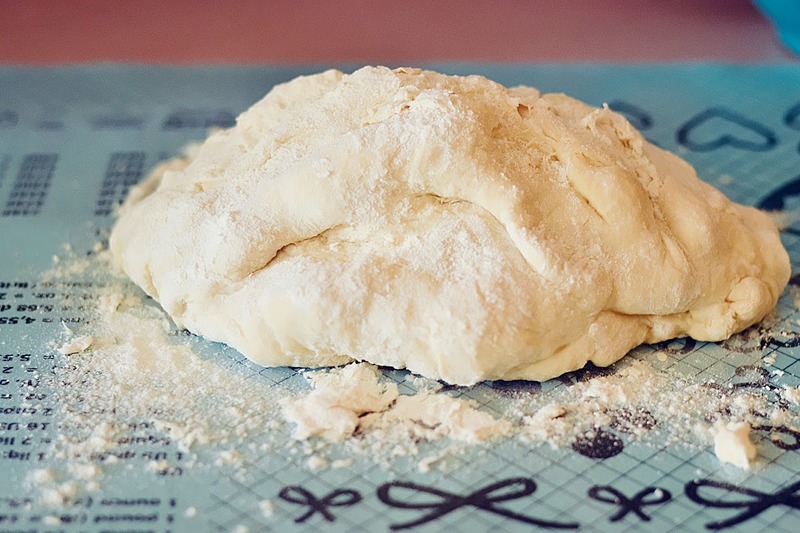 You want to hand knead the dough, about 10 turns, to make sure it's good. If it starts to feel sticky, add that tablespoon of flour and work it in until the stickiness goes away. 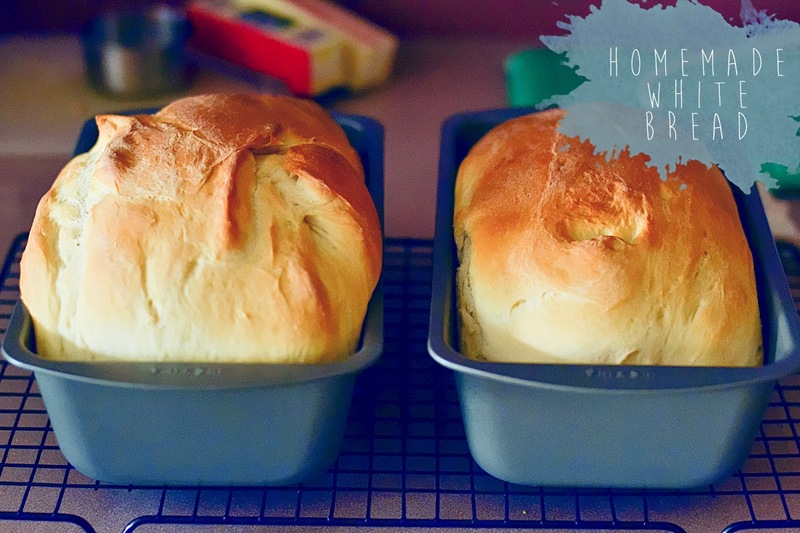 The first time you make bread, you may feel highly unsure about your dough being right. As long as it's not sticking to the mat or your fingers and has a smooth feel, you're good. It may still have to texture or look like it has a couple of lumps, but you're okay. Once you make it a few times, you'll get used to what you're looking for. Melt another tablespoon of unsalted butter and pour it into a fresh, clean bowl. 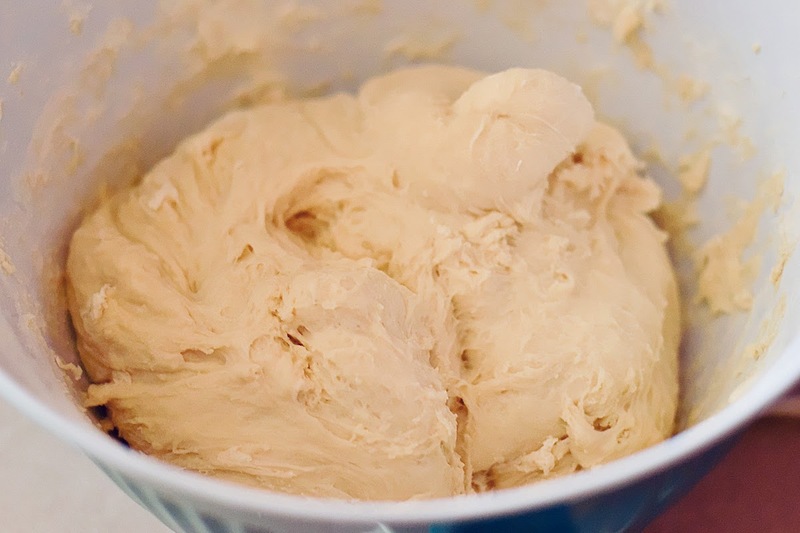 Place your dough ball into the bowl and give it a few turns to coat it with the butter. You can see the texture of my ball here, it's smooth but still has some lumps and bumps. It's also shiny because it has butter on it now. Why? The plastic wrap keeps your dough from hitting the towel, you don't want towel parts in your bread, yucky. And the towel, along with the plastic wrap, keeps the dough warm. Now it is time to let your dough rise for one hour. Remember earlier that I said I felt like I had the timing down? 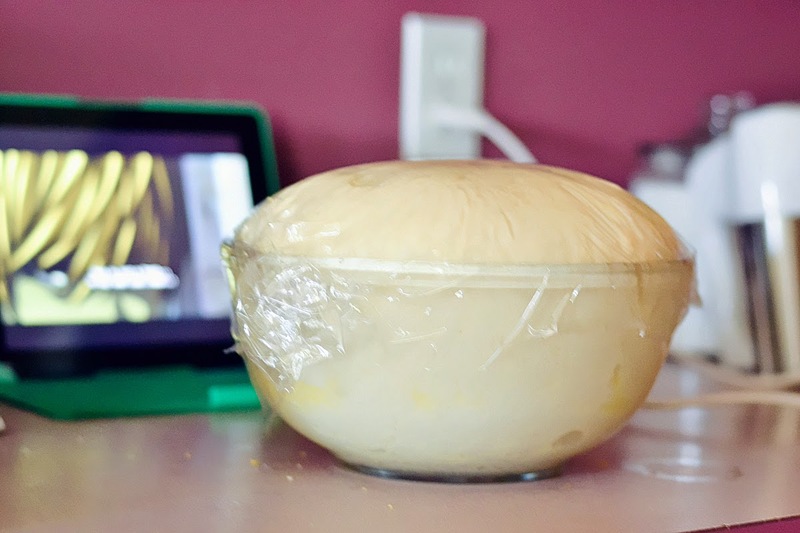 Do NOT skip this part, the dough must rise and it needs an hour. Don't go over, a few minutes while you prep for the next step is okay, but if left too long the dough will collapse and that's no good. Wash some dishes, read a book, catch up on some netflix, go for a run or whatever you desire, you have a whole hour. BOOM, check out that dough! I apologize for the shaky picture, sometimes I get caught up in the process and forget to double check my photos. 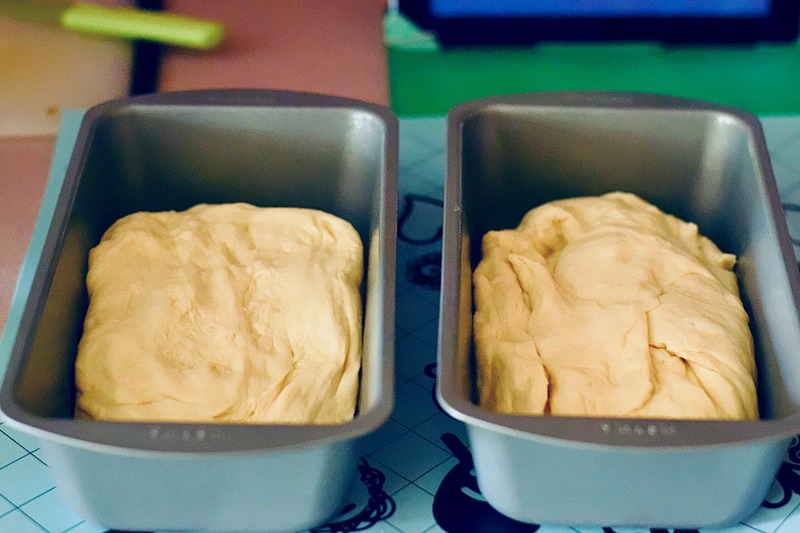 Uncover the dough and gently press it down, squeezing the air out. Some people say the punch the daylights out of it, I like being gentle and just pressing the air out. Plop it out onto a clean surface and work it out a little like this. It's like a sad little log. And separate it into two balls, try to be as even as you can, I'm not the best at it. I'm sure a food scale would help. You can work these back into smooth balls or leave them like so. I'm a bit lazy at this point, I work them a little, but not until they're smooth perfection. But be careful, you can overwork the dough! Spray two bread pans with cooking spray [I like pam, but anything will do] and place the balls into the pans. Push them down and make them fit into the length of the pan. You can see on top of my loaf on the right there that it's not smooth and together, this will reflect on my final product. I don't care because I'm serving it to my family. Again, cover the bread with plastic wrap and then a towel. 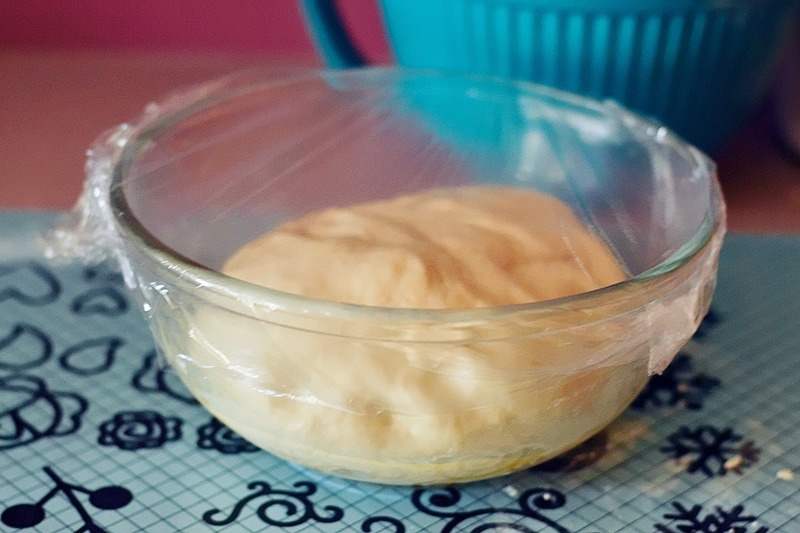 Be sure to cover each with a separate piece of plastic wrap, if the dough rises out of the pan, they make connect. And when you pull them apart, it deflates your dough. 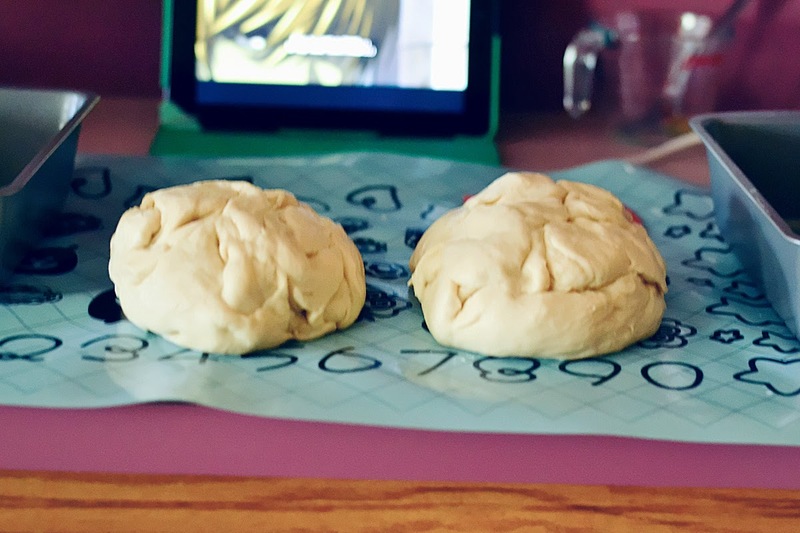 Let the dough rise once again, this time for 45 minutes up to 1 hour. I prefer 45 minutes, but if you want the bread to be bigger, you can go up to 1 hour. Just be aware it will rise more once it goes into the oven. This is what my dough looks like 45 minutes later, I am happy with this size because it's a great sandwich size in the end. 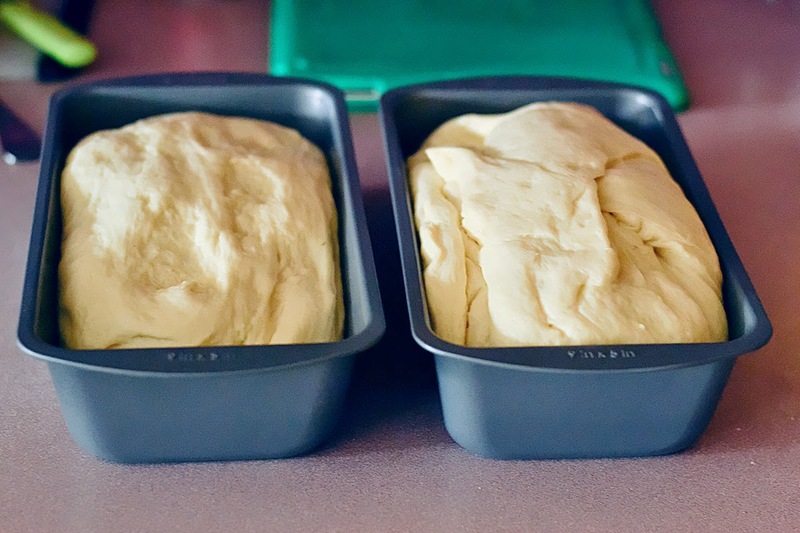 If you want bigger bread, give it that extra 15 minutes [1 hour total], no more. Heat your oven to 350 degrees [That's fahrenheit, I'm American] and place the bread in. 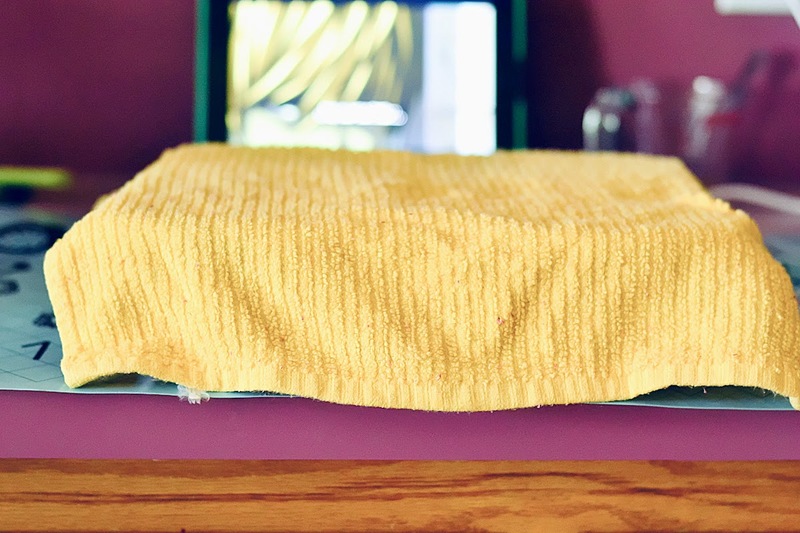 Be sure that your rack is in the center, you don't want the bread to burn on the bottom or rise and touch the top. Bake it 30-35 minutes, until it's golden on top. Melt 3 tablespoons of unsalted butter, this should be what is left of your stick. Remove from pans to a cooling rack and brush the tops with butter. You can cut them after about 15 minutes. 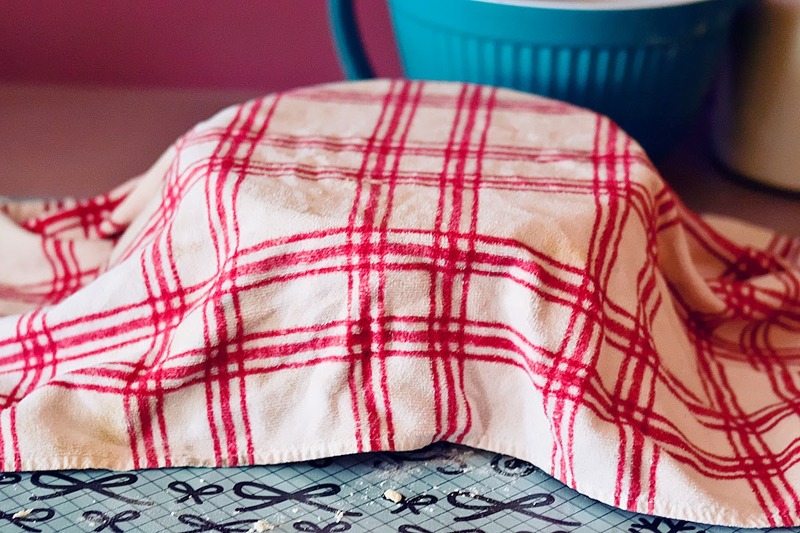 If storing them, allow them to completely cool before bagging. If you put them in a bag while still hot or warm, the heat will cook the bread and make it super hard. You don't want that. I do regret that I don't have a finished product photo! I forgot to snap one once they were out and buttered then left the house. When I came home, my husband had already sliced and stored one loaf and was snacking on the other. I was a little horrified. But I love him and it's really not that big of a deal. Next time I'll put up a "Do Not Touch Until Photographed" sign. And that, my friends, is how I make my bread. 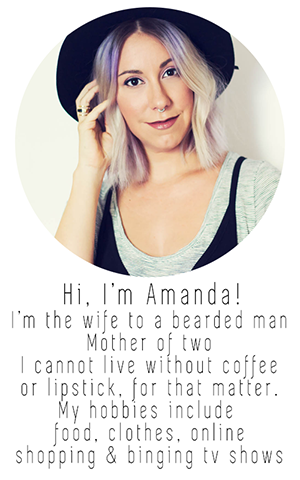 If anything is unclear, confusing or you just have questions, hit up the comments! I promise you, bread making isn't that hard, it just takes time and practice. I have faith anyone can do it as long as they don't cut corners and follow the instructions. If you make your own, find me on instagram or twitter and shout me out so I can see your bread.